I used my recent business trip to Shanghai, China to also indulge in some cultural activities. First, I participated in a new program of “Shanghai Flaneur”, a walking think-tank founded by one of my friends, Katja Hellkoetter. The topic of this newly designed walk was “Shanghai’s historical ballrooms and it’s ballroom culture”. Katja had invited me to join and get an idea what her Shanghai Flaneur initiative was all about. But before I take you any further, let us start with a re-union dinner on the river-terrace of The Seagull on the Bund Hotel – 海鸥饭店. 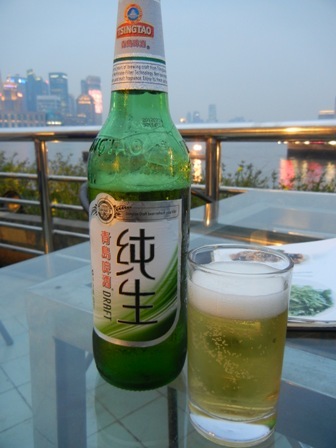 From here, one has a wonderful view of the river, the Pudong skyline and the Bund. 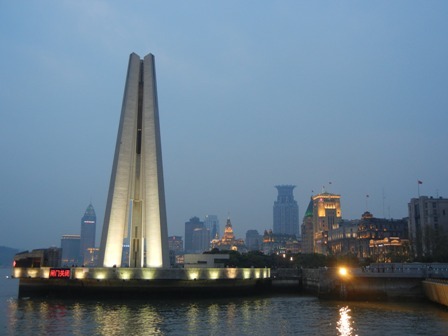 The hotel is in a perfect spot, at the confluence of the Suzhou and the Hungpu river. Re-union dinners are never perfect as far as the quality of the photo extraction is concerned. In fact I show you only three of the many dishes the two of us consumed. 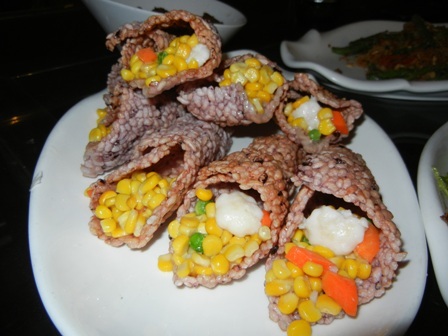 The first is a composition of doufu with leach and pine nuts, the second is shredded mushrooms with dried pork strips, and the third a puff-rice filled with various colourful vegetables and shrimps. 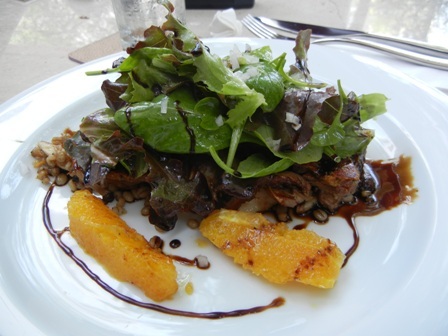 These dishes did not only look good, they were super-delicious. Needless to say, we drank beer with the meal. Unfortunately, it started to rain and we had to look for shelter. This did not bode well for the walk later that evening which was about to start in the Astor Hotel nearby. I will not give you an account of the walk proper, just of its beginning and the end. The walk was conducted by Andrew Field, a university teacher of Chinese history. From the Astor Hotel we walked along the Bund (fortunately, some of the participants had brought umbrellas otherwise I would have been drenched). And we ended the very interesting and entertaining culture-walk about two hours later at The House of Blues and Jazz. The House of Blues and Jazz is a great place. 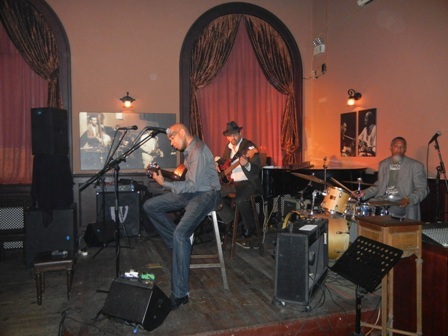 that very night the Greg Lattrell Band from Boston, USA played blues and soul music, what a treat. I just loved the music, especially the blues pieces they played, and stayed until the very end. 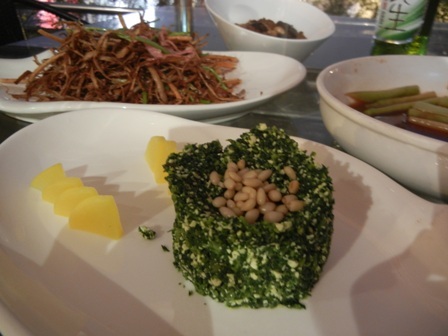 This was a perfect day, re-union dinner with Katja at the banks of the Huangpu river, the walk with the Shanghai Flaneur along the Bund, and the blues music of Greg and his band. 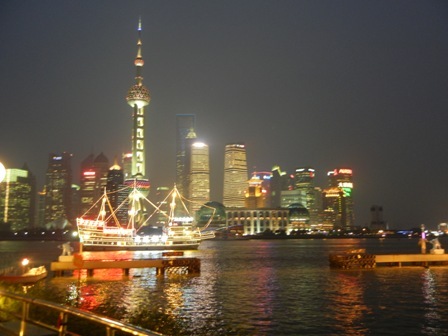 Come and see, feel and experience Shanghai, the Paris of the Far East. During the holidays there is always the odd day out where nobody wants to cook and/or prepare a meal but people are still hungry. The natural solution to such a challenge is: yes, right – food by phone. We all know it, we all experienced it. Here in Bangkok, food by phone is well organized. We all craved for pizza, and pizza it was. Needless to say, it was a delicious pizza. 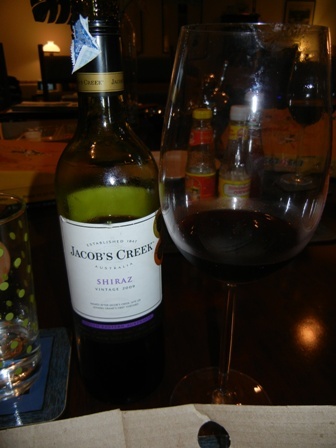 From the super market, we brought home a bottle of ‘2009 Jacob’s Creek Shiraz’. According to the bottle, it had won a gold (in 2011) and a bronze medal (in 2010) at some wine competition. However, ever since our days in China (1990-96), my wife hates Jacob’s Creek wines, regardless what medals the wine has won. I did not let it breathe enough, I guess. But after “warming up” it was a very nice wine, with supple plum aromas, a good structure and a reasonable long finish. 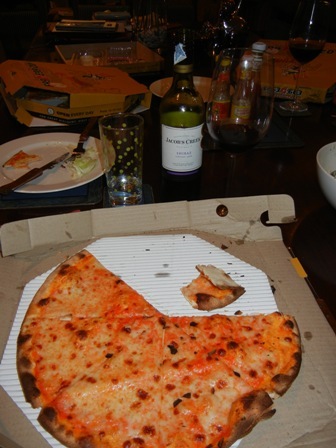 I was very pleased with myself, that I had bought this wine despite the strong negative feelings my wife holds towards this brand, and anyway we needed a bottle of wine to go with the pizza. Hurrah, we had a great dinner, and all four of us went to bed duly satisfied. It was a glorious Sunday morning, this Easter in Bangkok. 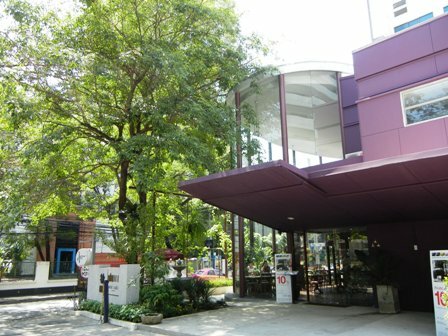 The four of us had booked a table at the Great Hornbill Bistro in Sukhumvit 39 which is basically the urban cellar door for PB Valley Wines. We came for a late breakfast and had planned to spend a couple of hours at the Great Hornbill so that we could also have lunch. I also intended to buy some of PB Valley’s wines. 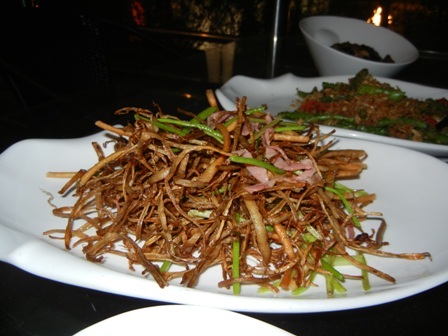 From the grand opening, we knew that the Great Hornbill offers excellent food and great service. 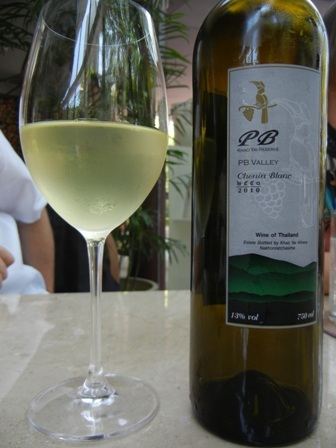 Moreover, we also like the wines of PB Valley Winery. We had not been back since that event, somehow it never worked out with all my travels, school and sport events and so on. 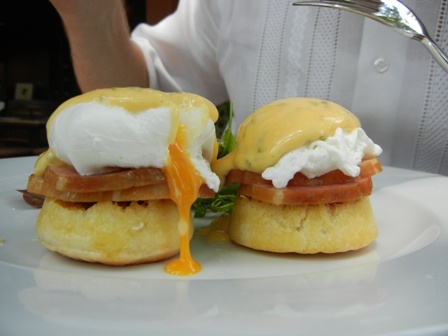 So let us see what we had: Breakfast first. We start the day at around 5.30-6.00 in the morning, usually on our terrace where we read and linger. So we had had our morning coffee (cappuccino) and a cookie with it. 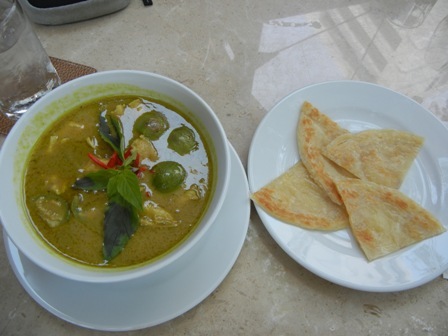 Naturally we were ravenous at about 10 when we got to the Great Hornbill Bistro. At this time of day, the place was not crowded, the waiters were very attentive and very accommodating to our needs. 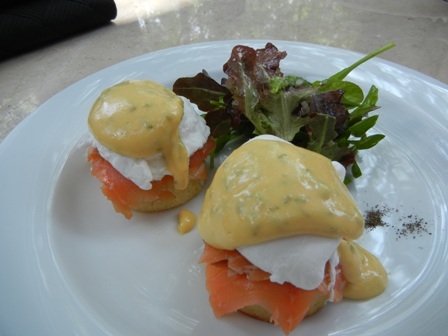 Egg Benedictine seemed just the right stuff, one was with salmon the other regular. 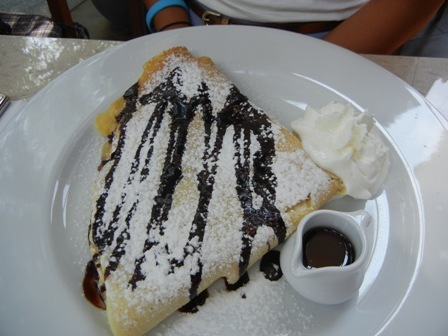 The girls went for the sweet stuff, a banana pancake. All very yummy. What a good beginning this was. Then (after we had some pleasant parent-teenager conversation) came lunch. This is a very nice wine, medium bodied with a good structure, with tropical fruit flavours and some vanilla from the oak barrels the wine is aged in (12 months). Very refreshing in the tropics, just the right wine to go with breakfast and a light lunch. Needless to say, we had a second delicious bottle of PB Valley Reserve Chenin Blanc. 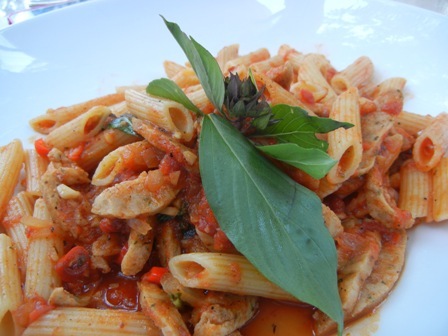 The food was very good, fresh and with great taste. 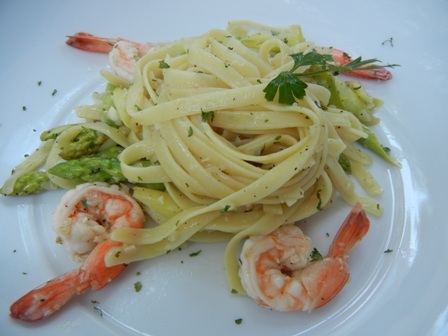 The pasta was “al dente” which in Asia is not easy to get (cooks often seem to think “noodles are noodles”). We had a great time, placed our wine order (the Great Hornbill delivers the wine to your home), and will be back soon. 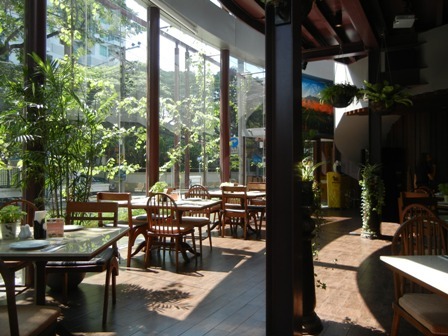 Do you look for a pleasant place to have breakfast? The Great Hornbill Bistro is it. 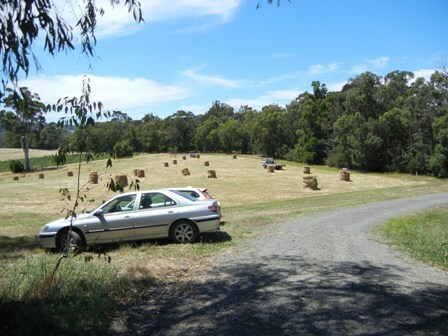 As the cars indicate, we had visitors at Two Hills Vineyard in Glenburn, Victoria. 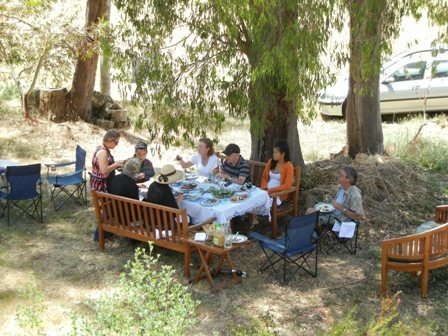 It was one of these occasions when we wanted to dine and wine with old friends. There is never enough time. We usually take it, as it comes and fortunately, Tony, Helen and Joe dropped by for a meal. My brother-in-law, Michael and his wife Helen completed the group of diners. The weather was wonderful, warm and dry, a typical summer’s day when farmers all were busy taking care of their hay. In the background of the picture above you can see the hay bales produced by our neighbour Victor. We were busy since the morning to prepare various dishes. 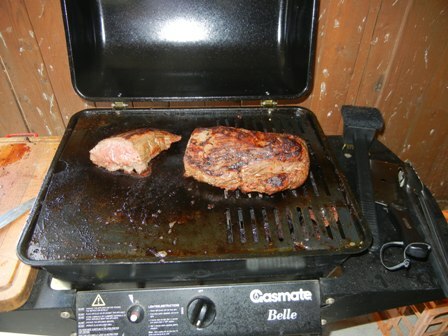 And as is customary in Australia, the senior male in the family is in charge of the grill. Alas, under the watchful eyes of my brother-in-law Michael my barbecue skills have improved over the years. 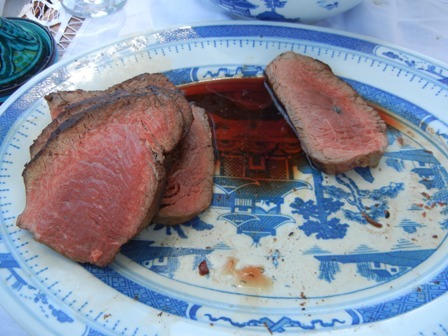 The quality of Australian meat is outstanding. We usually buy it from the butcher in Yea, a lovely little country town about 30 k to the north of Glenburn. I am always a bit nervous when grilling the meat. I am afraid to ruin these wonderful raw materials. 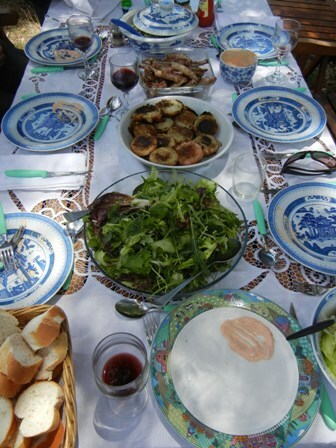 We had pork, lamb and beef, various vegetables and some Italian salad. Needless to say, all delicious stuff. Having friends over it always a great opportunity to sample all kinds of wine from Australia as well as abroad. With the strength of the Australian dollar, imported wines become more and more affordable. In fact there are more and more imported wines available these days. 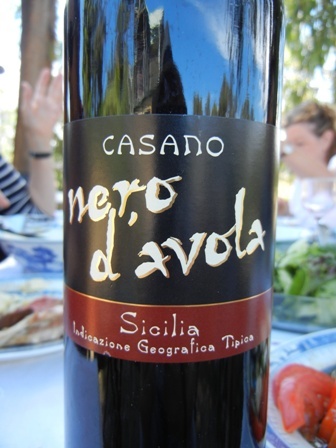 The ‘2010 Casano Nero d’Avola’ from Masala, Sicily was one of the many different wines we had with our meal. Casano Vini was founded in 1940. Ever since it is producing quality wines. Remarkable are their ‘TerrAntiqua’ and the ‘Classics selection’. The bottle we had was one of the Casano table wines. The red fruit aromas and the solid structure make this a great wine with red meats. But we also sampled a few local wines. From our neighbours in nearby Murrindindi (this is also the name of our shire), we had a ‘2008 Family Reserve Shiraz’ by Murrindindi Vineyards was an excellent choice for the meal. 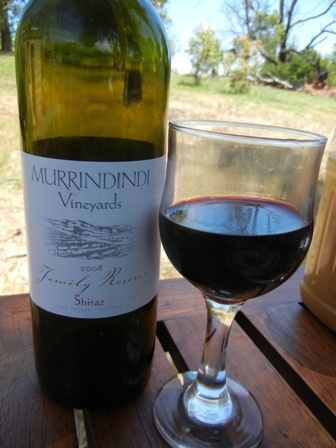 Murrindindi Vineyards produces the family reserve wines only in outstanding years of high quality fruit. The Shiraz was spicy and full of flavours. 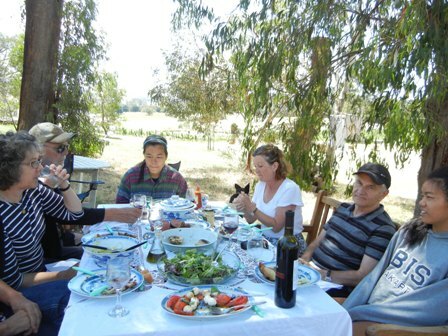 In our cool climate Shiraz produces outstanding wines, not every year though, but often enough. After the meal, we had to move into the shade. 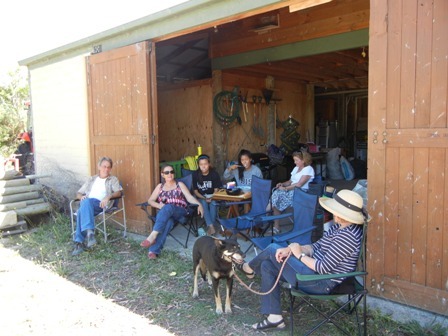 We opened the shed doors and sat in the cool of the mud brick building. The sampling of wine did not stop, of course. What a jolly good day that was. Oh, yes, those were the days”. These song lines from my youth (Mary Hopkin) come to mind. Come on, sing along with me. You are currently browsing the The Man from Mosel River blog archives for April, 2012.